Funder: The Aga Khan University (£20,000), 1 October 2016 – 30 June 2017; Principal Investigator: Dr Yasmine El Masri. 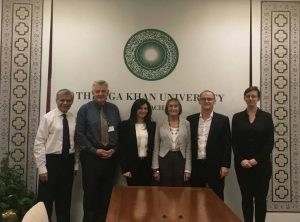 Collaborators: Professor Pauline Rea-Dickins, OUCEA, Roger Smith, Aga Khan University, Karachi. Click here to find the AKU Language Policy Thinking Group Literature Review. 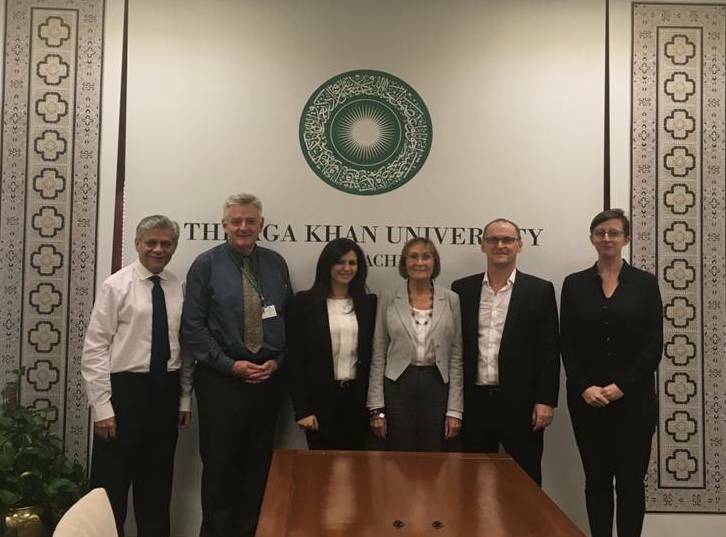 Inaugural meeting of the Language Policy Thinking Group at the Aga Khan University in Karachi Pakistan (October 2016). 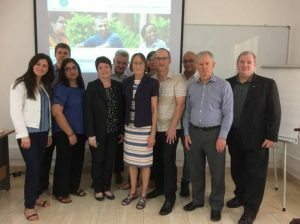 Left to Right: Professor Farhat Abbas (Dean of Medical College, AKU), Professor David Arthur (Dean of School of Nursing and Midwifery, AKU), Dr Yasmine El Masri (LPTG Research Coordinator, OUCEA), Professor Pauline Rea-Dickins (Chair of LPTG, OUCEA), Roger Smith (Director, ELE_net, AKU), Elizabeth Shepherd (Senior Researcher, British Council). English is the medium of instruction (EMI) in all Aga Khan University institutions (AKU) (Karachi, East Africa and London). However, most AKU students, faculty and staff are non-native speakers of English and very often demonstrate a low proficiency in this language making it significantly challenging to operate effectively in the medium of English. To address this challenge, AKU built the Network of English Language Enhancement (ELE_net) in September 2014 offering a wide range of activities to foster English language provision for its students, staff and faculty members. It also recognised that developing an AKU language policy is essential for building an effective strategy that tackles language related issues. In October 2016 the Language Policy Thinking Group (LPTG) was set up to carry out the work needed to develop an AKU language policy. The LPTG consists of senior Faculty and staff of the Aga Khan University as well as experts in applied linguistics and assessment and a representative from the British Council. The Language Policy Thinking Group met three times between October 2016 and June 2017. In the first meeting in Karachi (October 2016), the LPTG agreed on the aims of the project and the underlying themes of the literature review that will inform the following empirical phase. The literature review, forthcoming as an OUCEA report, described the complex linguistic landscape in which AKU is embedded and highlighted main context-specific challenges related to the use of English as a medium of instruction and language of communication in the workplace. The literature review also discussed most recent research focused on the impact of pre-sessional and in-sessional English courses on closing the gap between students’ English language levels at entry and exit levels and minimum language requirements in higher education. Current practices in different higher education institutions to support students with poor English language proficiency were also outlined. In January, the LPTG met in Dar es Salaam to discuss the findings of the literature review and agree on the main research questions guiding the empirical phase in which language Proficiency tests (Password Knowledge and Password Skills) as well as attitude surveys were administered to samples of students, staff and faculty across the University’s faculties and departments in Pakistan, East Africa and London to investigate the levels of proficiency in English of AKU’s constituencies and examine their needs and their attitudes towards using English and other languages (Urdu, Kiswahili as well as local languages) as a medium of instruction and communication at AKU. 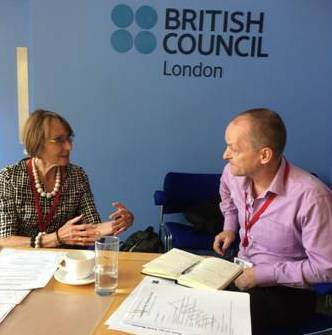 In June, the LPTG met at the British Council in London to discuss the findings of the language tests and surveys and to agree on the format of the final report that will ultimately be submitted to the Board of Trustees with recommendations for further actions.